Truck drivers need to get freight from Point A to Point B as quickly as possible in order to keep costs down, pay up, and sometimes even to keep a job. Unfortunately, this kind of pressure can contribute to bad driving practices―rushed driving that leads to tailgating. As truckers know (and what non-truckers don’t always seem to understand), commercial trucks are extremely heavy, especially when carrying a full load, and require significant room to be able to come to a complete stop safely. People usually don’t take this into consideration when they’re pulling into a lane in front of a large truck without leaving sufficient space. A safety-conscious truck driver will keep a safe distance between his or her truck and the vehicle ahead but it’s not always possible to maintain a safe driving distance when traffic is heavy or the road ahead is not a big expanse of open road. In cases like this, cautious truck drivers will stay in one lane and let the other drivers do the lane changing. Driving while drowsy is a huge problem in the trucking industry. To combat this, Hours of Service rules were put in place, designed to keep drivers from operating a truck while drowsy. Unfortunately, Hours of Service may contribute to another problem: causing truckers to rush to complete a run before their hours are up. Truckers being tailgated is another problem. Sometimes “drafters” will follow too closely behind big rigs to reduce the wind resistance on their vehicle. This cuts their gas mileage considerably but is extremely dangerous. Trucks have a significant blind spot behind their trailers and they may not even be aware that someone is drafting until it’s too late and they are rear-ended in an accident. 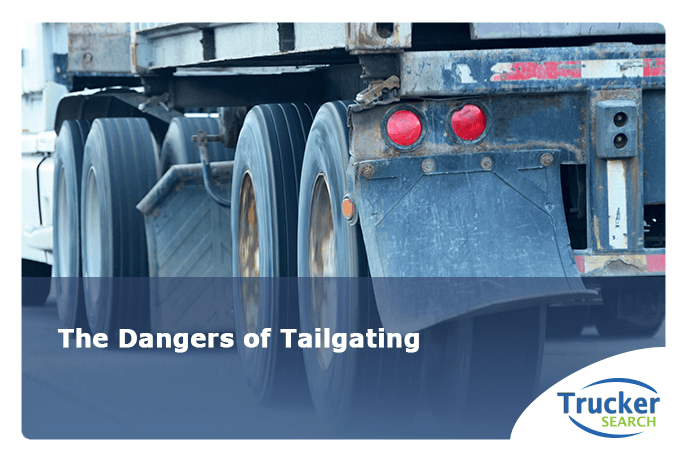 Tailgaters will get into accidents, and there are no fender benders when it comes to big rigs and tailgating. Being involved in an accident will slow a trucker down, definitely more time than what might have been gained by tailgating. Along with the accident and delayed delivery, the truck driver might receive an insurance increase, traffic fines, hospital bills, physical therapy bills, potential job loss, and lawsuit. The ramifications of tailgating easily outweigh the few minutes you might save by driving recklessly and tailgating. If the potential dangers with tailgating aren’t enough to make anyone think twice about doing it, consider this: It’s also against the law. The safe distance rule-of-thumb for all vehicles is to maintain one full vehicle’s length between vehicles for every 10 MPH traveled. If a truck is traveling along at 50 MPH, it should be 5 full truck lengths between it and the vehicle in front of it. Of course, this doesn’t take into account the weight of the cargo or road conditions, weather, tire conditions, or visibility. Or, according to the FMCSA (Federal Motor Carrier Safety Administration), if driving below 40 MPH, there should be one second between vehicles for every 10 feet of vehicle length which would be 4 seconds for tractor trailers. For over 40 MPH, an additional second should be added. For adverse conditions, time should be doubled. The bottom line is, if you’re a trucker who wants to avoid accidents and fines and wants to make deliveries on time, DON’T TAILGATE! Trucker Search is an online tool that helps great drivers find great companies. Drivers can search our extensive driving employment database or post their resumes and let trucking companies find them. Go to TruckerSearch.com and find your new job today!